I was born and bred in Redditch, and, to me, the town and it’s people do not get the credit they deserve from the county and the country. Almost on a daily basis I meet people who are working tirelessly to make a difference to our town but their efforts are very rarely acknowledged. 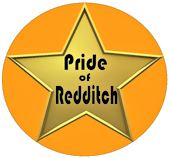 Local people need a greater sense of pride in our town and this is about celebrating all the good work that local people do day in day out that helps to make Redditch a better place to live.